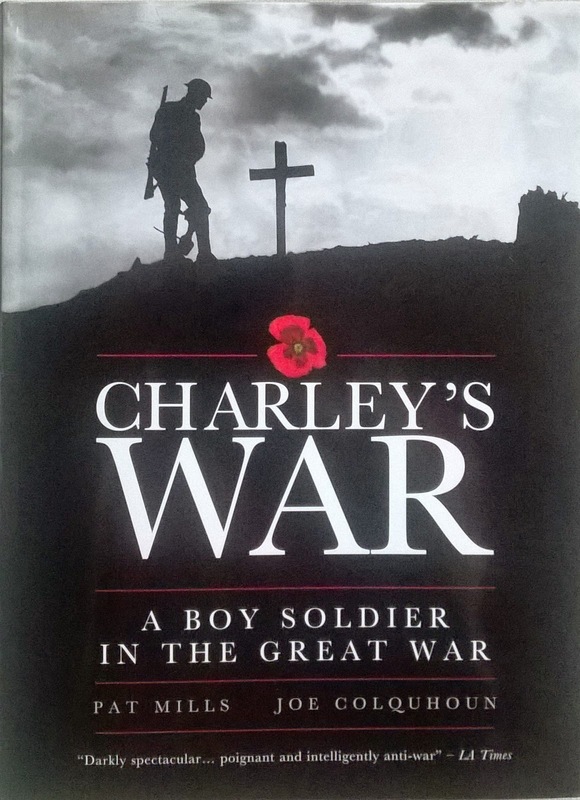 Unsocialized: Teaching War; "Charley's War..."
Before computer games, x-box's, wii's, Play Stations and Tablets, adults used to worry about what children were learning from comics. 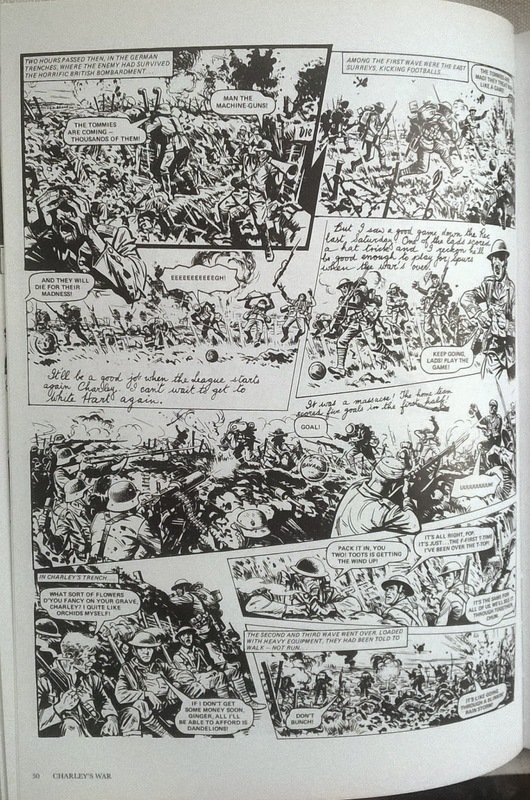 Some comics and comic strips were mentioned in Parliament. Some violence was blamed on them; our children's morality was in danger. They were lapping up violent imagery and learning what? Children in the late seventies, were not child minded by violent imagery and TV in the same way some young people are nowadays. TV in those days, the one (or two max per house) if not controlled by parents, was certainly controlled by the broadcasters and Government. "Boring adult programmes," news, documentaries, dramas, were empowering for children. It made us want to be outside, summer, winter, spring or autumn! Tablet TV, games and skype have disempowered a generation, and learning about war and crime and excitement nowadays can be solitary, unguided and unmediated. Online video does not change at 9 o'clock pm. And the real, vicious, unmediated violence of modern war is easily found through Google. Technology has changed interactions within homes, but as all new innovation, society will integrate it eventually and adapt. But change perhaps needs to be a little more conscious than previous integration of new work practices, leisure, escapism, transport and communications. Some war comics were pure escapism. Some funny, some fantasy. My favourites were the spy stories or the stories about slightly off the rail commanders or the stories that told some of the unusual history of World War 2. "The glamorous war." When I was in Primary Seven I wrote a book, about Sammy, who ran away from home and joined the navy. He was a sailor on the Ark Royal. My first obsession. My first escape. I wanted to join the navy to see the world. Like the spies in my favourite comics. Like those in the TV series about the Ark Royal with the Rod Stewart theme tune, "Sailing." Mediated, propaganda TV. Many young people fled their immature, mundane lives for the blood drenched fields of France and Belgium between 1914 and 1918, persuaded by posters, Reverends, factory bosses, women with feathers and other empire glorifying, pointing fingers. And as we know, many didn't return. And then there was Charley. He joined the army pretending he was old enough. He wanted escape, and this war seemed, through the propaganda, to offer that. And he ended up in the Somme. Charley was a happy go lucky Londoner, wanting to see life beyond his patch. But what he saw was dreadful. A very unglamorous, dreadful war. And what I saw, what I longed for, was "what happened next?" The weekly wait. The mediation, when I went off and did other things. When I bought the comic, I would flick through it, check if there was something I could read without spoiling the story, and then I would read the stories in the order of, well, favourite one at the end. 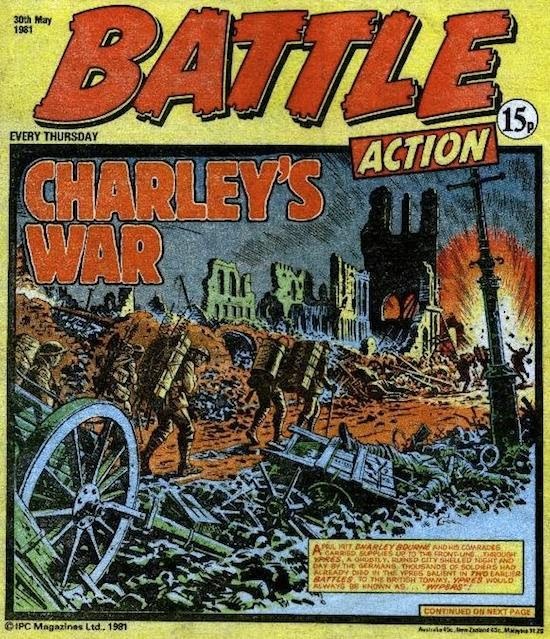 Charley's War, a comic strip in the '70's-80's comic, "Battle," was really different from the other action and adventure stories I read. Although to me, WW2 was historical enough- thirty years before- WW1, with its mud and shaky, blurred, hand cranked, speeded up shadows dying as they crossed no mans land, was as far away to me as the Romans. It was about people who could not possibly be like people nowadays, in fact their visible ancientness and very different ways, proved that. In the seventies, Charlie Chaplin and Buster Keaton films were shown on Saturday morning telly, over cranked, the comedians speeding around the static scene in their almost Victorian clothes, falling and getting up. The soldiers ran forward, over cranked, through what looked like mist, falling, but not getting up. Through the silver oxide miracle of the time, the documentaries showed us the last gasps of some mothers sons, some children's fathers, sixty years before, but playing it through seventies technology made it look as irrelevant, to me as a child, as the Saturday morning falling down slapstick of Keaton or Chaplin, the horrific footage negated by the wrong playback speed. Nowadays that has been corrected. These old men I met. The local survivors of those strange, grainy, almost comically fast movies. 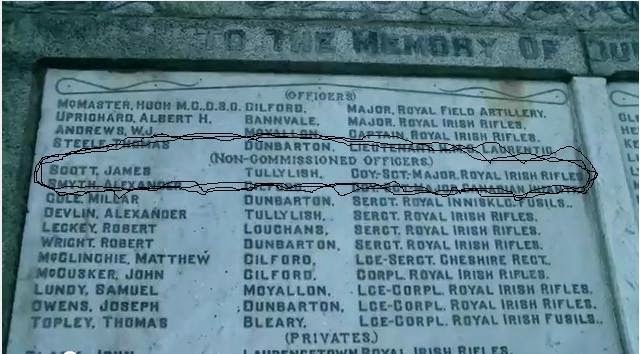 My Great Grandfather who still carried shrapnel in his body; the old men who placed wreaths on the memorial in church once a year, below, the names carved into white marble. 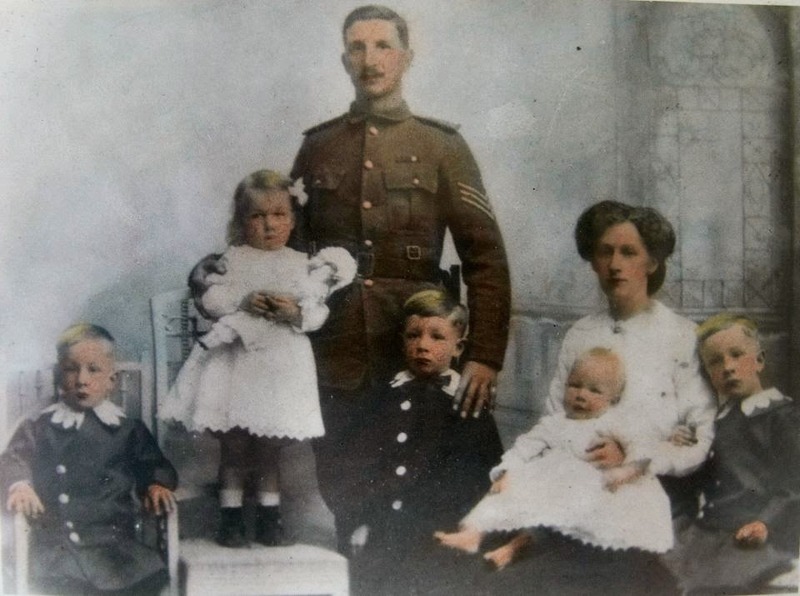 "James Scott, Coy Sgt Major, Royal Irish Rifles." I knew he was my Great Uncle. My Grandfathers brother. And I stood as a child, reading his name trying to know him through the marble. I used to think to myself as I stood in the church, "How many read his name and remember him?" And I guessed, "No one." And I made sure I read his name every time I was there and try to figure out through the name in the stone list, who he was. Of course, now as an adult, I am sure my grandfather must have read his name. He must have had memories of this man, returning now and again for visits, playing in his head. No one spoke of him. And I thought he must be a hero. I knew he died in WW1, and I was told he had died stepping out for a smoke. And I saw his picture, hidden in a cupboard, framed, woodworm pocked. But those men were so distant. There were no movies about World War One. And no one talked about it. The old men laying the wreaths sometimes had to be helped to the memorial. And they looked sad. On the way out of church, I couldn't look towards them. I didn't want to see tears. When my granny and grandad died, I took the huge, framed picture from their house and placed it on a shelf. He looked down at me, knowingly, a life hidden by time and by unshared memories. I had questions that now that generation were gone, it was too late to ask. James before I reframed the picture. And Charley told me why. Charley taught me the reasons that generation didn't talk about these things. Who would truly understand? Charley taught me that these people were young, not long ago. His lively, sometimes funny letters home showed the mask these men wore every day as they smiled, chatted and patted me on the head. In those days, old people gave children sweets. I always knew which ones carried. Those were normal days, when people talked at their front doors or popped in for a cup of tea on their way to the bus. Lots of these men had seen action; had been forced into the paths of hot, lethal, metal rain. Death. Agony. Horror. And they lost brothers and pals, and huge chunks of their soul and I know that now, without fully understanding the feeling of entrapment and fear and the feeling of pushing a knife into someone's guts and watching the life scream out of their widened, sorry, pleading, scared eyes. 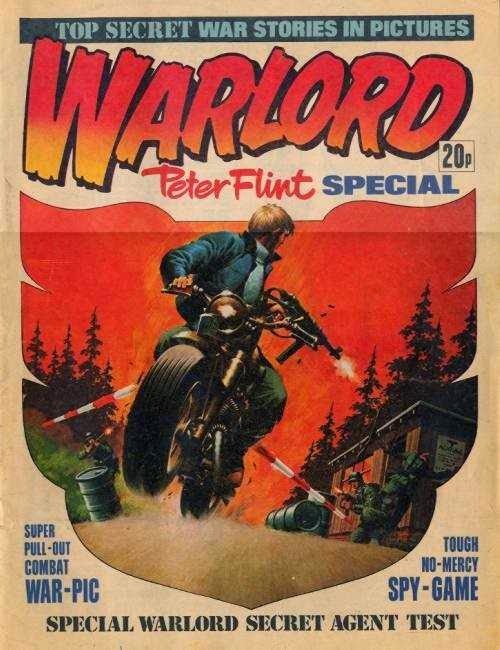 And weekly, I bought Battle and Warlord, my eyes devouring the adventures of Johnny Red, Lord Peter Flint, Major Easy, Rat Pack, Killer Kane and Union Jack Jackson. I always left Charley to the end. He was different. He was alive. Real. Not a super hero, or skilled in anything in particular. He joined up to escape... Why do we always want to escape? He was a good person who had friends around him, other flawed people thrown into the mud and gore and wickedness of the Somme. And he got letters from his family berating him for not writing and the football and the street gossip and when he did write, he never told them the horrors he witnessed. My knowledge of my Great Uncle has vastly improved. I was contacted by a man from Belfast, Mark Scott, a very distant relative. I was able to help him with our family tree; where the Roberts'/ Bobs', including my dad, fitted in. And I introduced him to my dad, even though I've never met him myself. All of our conversations have been by the magic of WiFi. But what he has been able to tell us is incredible. I know some of James. Where he worked. How he ran away from the dreadful bleaching works and joined up under aged and served in South Africa against the Boers. How he distinguished himself, Mark says,"He had experienced defeat at the battle of Colenzo and terrific victory at Pieters Hill and Ladysmith. He had also been taken prisoner by the Boers in September 1901 at Blood River Poort when his unit was ambushed and surrounded. 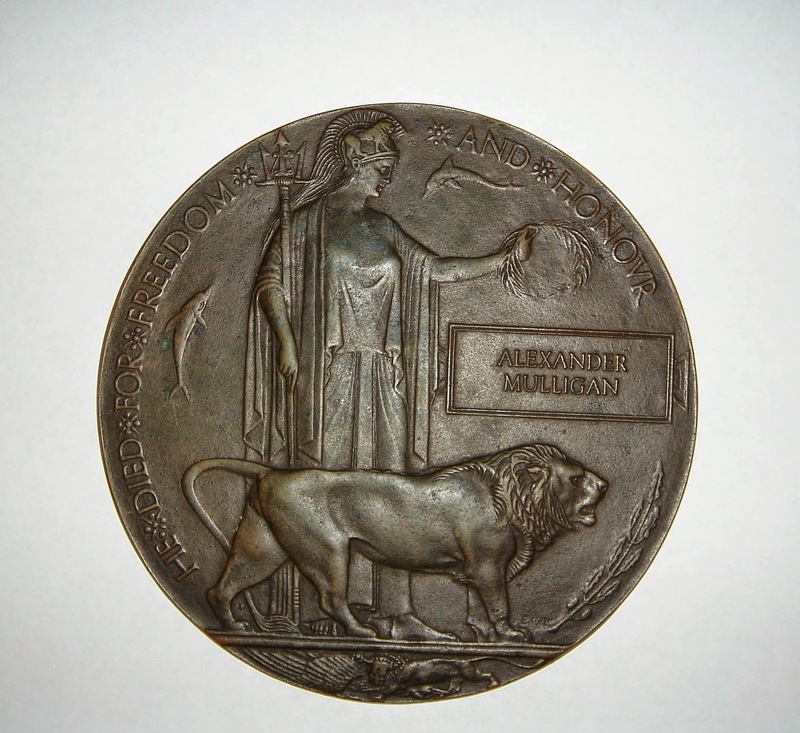 He remained on the army reserve until 1910." He left the army to work in Grangemouth, Scotland, and then on the buses in Belfast. How he met his wife and they had five children. I now have photos of him with his family. And how he helped smuggle guns into Ulster to fight against the army he had once served. He was a Young Citizens Volunteer man, fighting home rule against the British Army, when war broke out and the paramilitary groups joined with the rest of the armies to fight the common cause of the growing German Empire, whose aristocracy and corporations were threatening other aristocracies cash cows and corporations. And James became a bomber and a high ranking one at that. Mark sent me material, about where and when James fought. 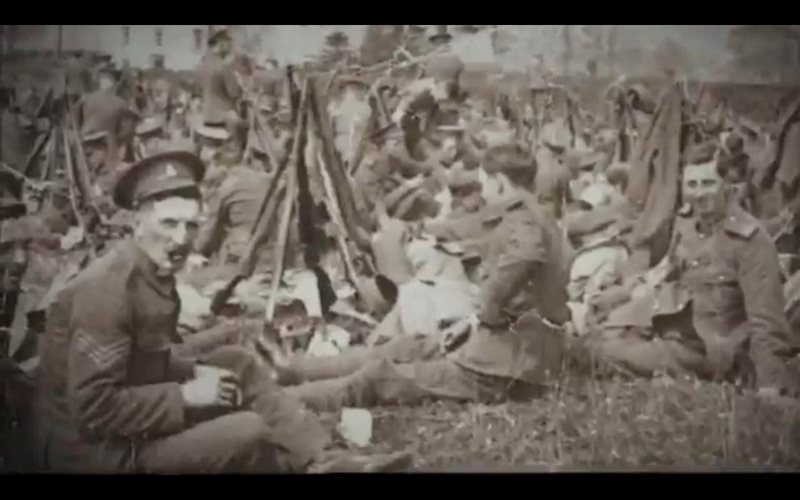 His battalion fought at the Somme, on 1st of July 1916. James battalion was, like most that day, decimated. What he experienced, what he saw, heard, felt was horrific. The fear. The noise. The friends he must have seen dying, mowed down in mechanized death. Forced to walk out against the metal storm. Mates from home; people he knew from the wee town lands of Kernan and Lawrencetown and Tullylish and the town of Gilford. People he had grown up with, been politicized with, blown apart. Mown down. Poppies. And he must have, that man from the leafy hedges of Tullylish, killed. Watched as men were blown to bits by his bombs. That was his job. He must have fought at close quarters, stabbing, punching, strangling, kicking, shooting and stepping on the carpet of dead sons, fathers and brothers. And his commanding officer described him as cheery. Just like Charley. Cheery in the depths of hell. Did he witness the Surreys given footballs and told to kick them as far into the German trenches as they could? A cynical game, designed to negate the camaraderie of the reported Christmas 1914 truce and football match. Like Charley, and his friends, MY friends as a nine year old, did he make the choice, "forward to almost certain death, instead of backwards to certain death by firing squad?" Forced by the men who dined on Harrods Hampers behind the lines, ordering wave upon wave of machine gun fodder forward, trampling over the dead, the dying and the body parts. Their deadly game, played out on a board and their mistakes ending lives and decimating families in "blighty." 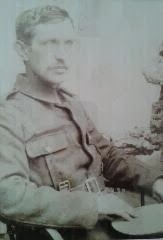 James photographed by George Hackney after a hard day at the front. I devoured Charley's story. The alien, ugly landscapes and the cheerful banter between Charley and his friends, main characters who over weeks I had got to know and who, unexpectedly, stunningly, shockingly got shot, blown up, killed. Charley picked up the dismembered body parts of best friend, and personally buried him. He witnessed and was ordered to take part in what nowadays we recognise as war crimes -as if all war is not a crime. Did James? Did my other relatives? 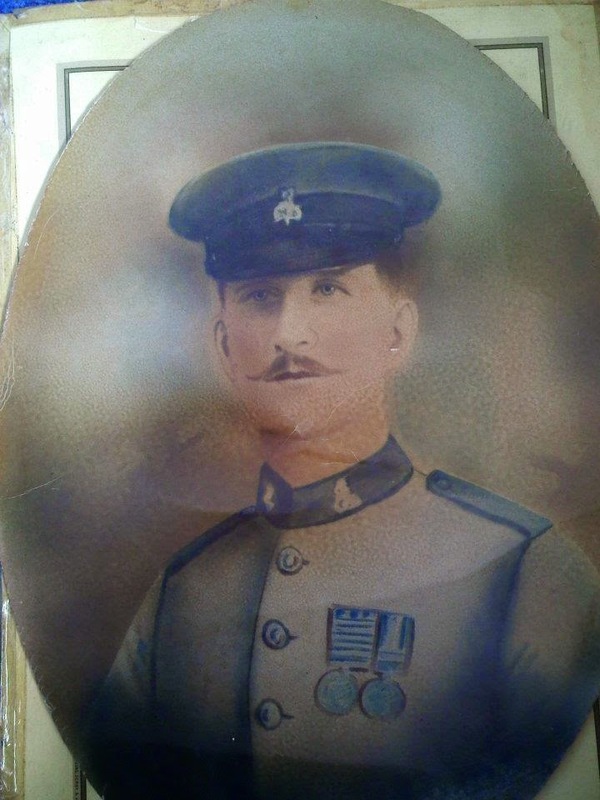 My Great Grandfather, Thomas, on my mothers side came back from war, broken. An alcoholic, from whom my grandfather used to hide the axe, as his brave, damaged da' when drunk, wanted to kill the local landowner and those who had urged them all to the slaughter. His words to my grandfather have been passed down the family line,"if you ever join the army, I'll take the axe to you." What wonders abroad had he ran away to see? What memories of the world beyond Magherally did he have, behind weeping, reddened eyes? These men, what they were ordered- forced to do, meant women and children struggled. They had to pick up the pieces. They starved and they went, desperately, without. And the awful acts of war; the awful act of mechanised slaughter; the awful act of forcing teenagers and men to rip other men apart, caused misery and screaming silence for years to come within melted minds and across a guilty, misunderstanding society. 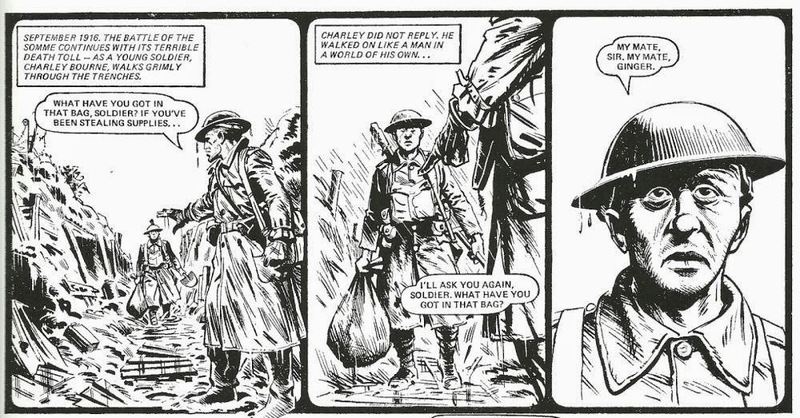 The story of Charley, written by Pat Mills, and brilliantly, graphically drawn by Joe Colquhoun, was decidedly anti-war; designed to show those who read, the realities of the murderous mayhem, dehumanising all who were there. And most boys my age read. Most of us must have learned from those pages. Those left behind had horrors behind those kind eyes, the ones who were strong enough to endure the memories. My Great Grandfather died in his early forties, broken, angry, sad, a shadow. The story tellers within the pages of the weeklies were teachers, teaching me things my family didn't want to, nor TV or Holywood wanted to, or knew how to portray. Horror after muddy, gory horror did not interest film makers. Today's children have Call of Duty and other, frenetic, enveloping, involving, electronic comics without soul. So destructive and unquestioning of war, that, for example, gamers seek to humiliate the dead by dancing on their "dead" bodies, desecrating them (known by the sexual term, "teabagging") to gain points, health and extra armaments. Games have adrenaline, excitement, but not fear, grief, total loss, pain, physical effort. The choices are different- carry on for points or switch off (as opposed to jail for desertion, losing pay or your income or firing squad or German machine gun), losing a game has little real, long term effect on the player or their families, or personality, or in changing life experiences. No one is left to grieve over the pixels. No one has to heal broken pixels. There is nothing teaching today's generation of tekked up children what the death of Ginger taught me. Or the court-martialling and death by firing squad of Thomas. Or soldiers ordered to leave the dug out at 30 second intervals to be executed. Were is the anti-war counter to the glorification and celebration of war our society throws at young people? Where is the counter to the language of "Heroes," "Brave," etc? The counter narrative of "conscript," "forced over the top," "economic conscript," "court-martialled by firing squad," ruined lives?" Where is the emotion? The teaching about the "lives" within their pixelated, sped up, adrenaline heightened world of machismo? Real back stories? Their worth? The realities of the theatre of war? Those left behind? The sudden loss of a life -and that it is gone forever? My comic friend survives the battles, but not untouched. Not like Major Easy, or Lord Peter Flint, with antics and near super human daring do, but with luck. 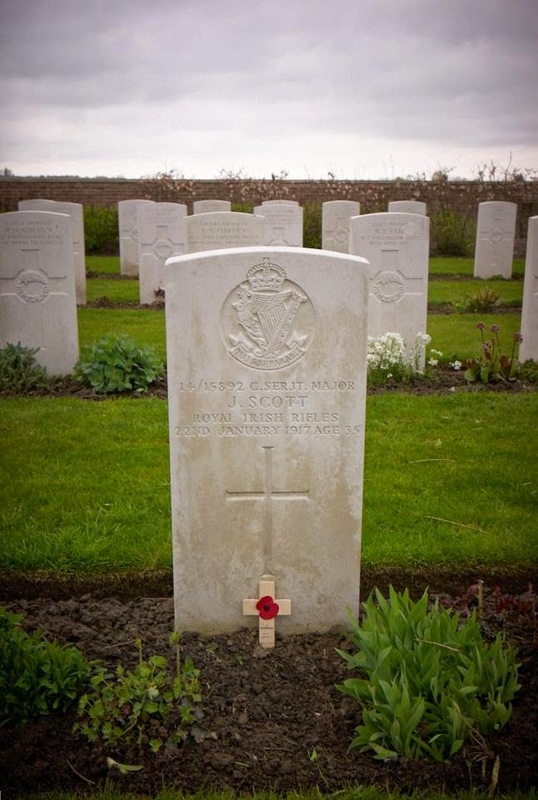 He is shot, trampled in the dirt, near to death and suffers the horrors of memory loss and "Shell Shock." My last memory of my Great Grandfather was sitting in a pub having food. My Great Gran had not long died. He looked sad, but was chirpy, positive, as he always seemed to be. There, I knew at that time he had shrapnel in his body. I remember staring at him, while the adults spoke, and trying to think what he knew. What he had seen. Had he seen what Charley had seen? And I recognised there was still a silence. A holding back of all he felt. A generation of emotions suppressed. And a suppression of emotions passed down as the normal way to live, which was not intended. And I know of other relatives now, their stories still to emerge. Thomas went to war with three brothers. One of them, Alexander, the youngest, never returned. Another family wrecked, struggling with loss. 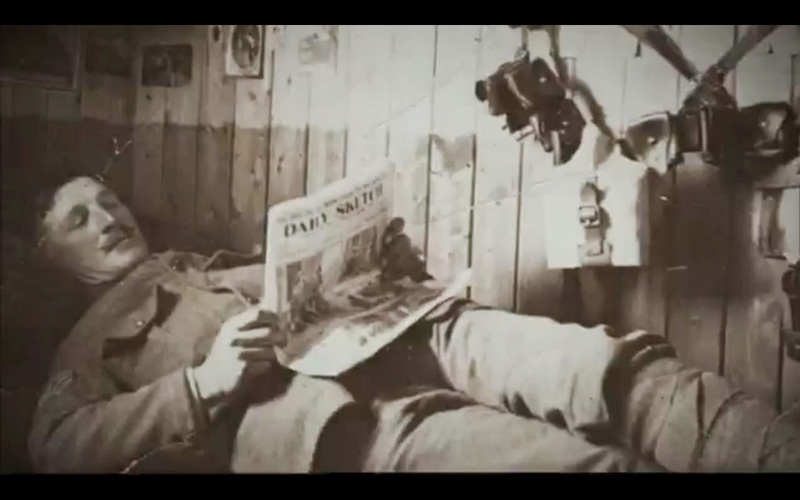 James Scott met George Hackney, a sniper, who's photos of James were found by Mark, and then Hackney's and James's stories were unravelled by Mark and the BBC. 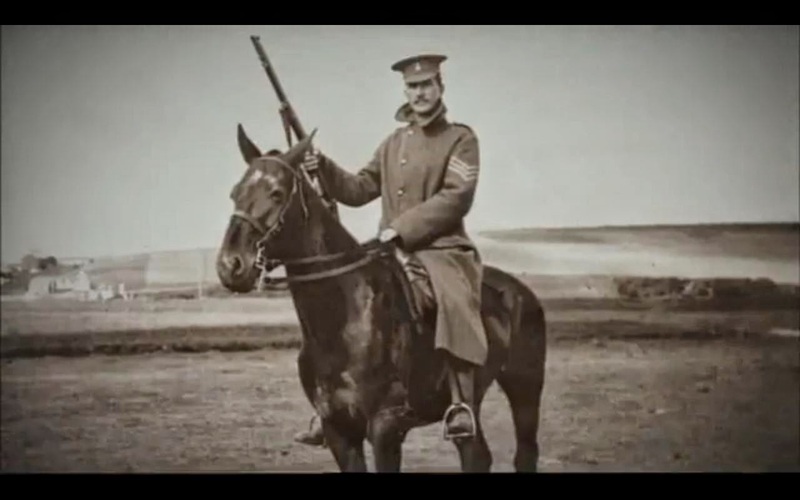 Click HERE to see an excerpt from "The Man Who Shot the Great War." James relaxing in the dug-out where he met his death? Five children without a dad. A wife left to struggle with emotion and money. And other, mentally smashed men thrown into a society that could not listen. Mark brought James story to me. 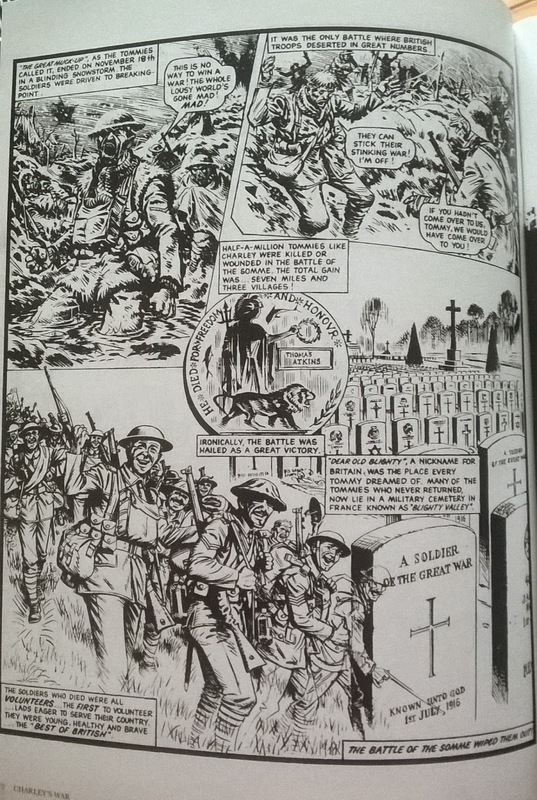 And in my mind, the world James saw, beyond the photos (though some of the photos are of dreadful, truthful, alien scenes of death), are the scenes so skillfully researched and rendered by teachers, educators, counter narrative, honest, Pat Mills and Joe Colquhoun. The violence shown in their weekly graphic novel showed the repercussions. It showed the futility of it all and the violence of imperialism. Their work should be on the curriculum.